#AbhishekBachchan along with other eminent film personalities offered their respect and attained the funeral for filmmaker Nikhil Advani's mother, Rekha, who passed away suddenly. “Kal Ho Naa Ho” director Nikhil Advani’s mother, Rekha, died suddenly on Saturday, confirmed the family source. The cause of her death is not disclosed as yet. The last rites were performed at Banganga, Nepean Sea Road, around one in the afternoon. 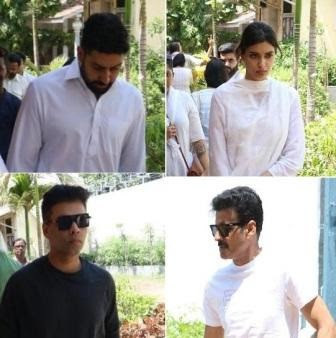 Actor Abhishek Bachchan along with filmmaker Sudhir Mishra, Karan Johar, T-series owner Bhushan Kumar and veteran actor Manoj Bajpayee, Actress Diana Penty and director Sahid Ali were seen at the prayer and funeral. Abhishek Bachchan hugged and consoled Nikhil Advani. The last rites were to be performed at Banganga, Nepean Sea Road, in Mumbai at 1 pm on Sunday. Besides Nikhil, Rekha is survived by daughter Monisha and son Kunal. The family shared the following message with well-wishers: “With grief and sadness, this is to inform you that Rekha Advani (m/o Monisha, Nikkhil, and Kunal) passed away suddenly this evening. Funeral and last rites will be tomorrow, Sunday, Apr 8 at Banganga, Nepean Sea Road at 1 pm. We will update details of Marka as soon as we have more information.”. Nikhil debuted in Bollywood as a director in 2003 with Kal Ho Naa Ho and then went on to make Salaam-E-Ishq, Chandni Chowk To China and D-Day.